The final night of the NBA season was surprisingly important, with two spots in the playoffs up for grabs, and eight seeds still undecided. Here is how the wild final night played out, and what the playoffs will look like. No. 1 Seed, Golden State Warriors - The Warriors have been locked into the number one seed for a couple of weeks now, as they lapped the rest of the West to go 10 games up on the field. No. 2 Seed, Houston Rockets - Coming into the night the Rockets were tied with the Spurs for third, a half game behind the Clippers. James Harden and co. handily dispatched the gone-for-the-summer Utah Jazz to tie the Clippers, at 56-26. The Rockets nab the second seed by virtue of winning the Southwest Division, while the Clippers were only second in the Pacific. No. 3 Seed, Los Angeles Clippers - The Clippers finished the season as the strongest team in the NBA, winning 14 of their final 15 games. It was just enough to assure them home court advantage in the first round of the playoffs. No. 4 Seed, Portland Trail Blazers - The Trail Blazers actually have a worse record than both the five and six seeds, but are guaranteed a top four playoff seed because of winning the Northwest Division. Crucially, they are NOT guaranteed home court advantage—this is still determined by record—and therefore will begin the playoffs on the road. No. 5 Seed, Memphis Grizzlies - The Grizzlies spent much of the season right behind the Warriors, but faded fast as injuries took their toll. They managed to dispatch the Pacers tonight without the injured Mike Conley and Tony Allen. Given that their first round opponent lost Wesley Matthews for the season while Arron Afflalo and Nicholas Batum also have more minor injuries, who knows what’s going to happen in that series. No. 6 Seed, San Antonio Spurs - Besides the Thunder (we’ll get there in a second), the Spurs are the real losers of the final day of the season. They could’ve secured the second seed with a win, but instead went down to the Pelicans early and weren’t able to claw back to get any closer than down three. Coupled with the Rockets and Grizzlies victories, they drop all the way to sixth. They will likely have to go through the Clippers, Rockets, and Warriors on the road to make it back to the NBA Finals. That’s brutal. No. 7 Seed, Dallas Mavericks - The Mavericks have been locked into this slot for awhile. They are clearly a step below the six teams above them, but also clearly a step above the Pelicans vs. Thunder scrap for a final playoff spot. They beat the Trail Blazers tonight in a meaningless game. No. 8 Seed, New Orleans Pelicans - They had to play a Spurs team with every incentive to win, and beat them. Anthony Davis went for a monster 31-13, and the Pelicans guards slashed to the basket for easy buckets all night long. They’re going to flame out in four or five games against the Warriors, but this’ll be the last year Anthony Davis will be overmatched in the playoffs. Next year he might take over from LeBron as the best basketball player alive. Sadly, this means the Russ Westbrook Show is over for the season. Without Kevin Durant or Serge Ibaka they would’ve been dead in the water anyway, but it sure would’ve been fun to watch Russ go off against the Warriors four more times. He had 34 points in the first half of tonight’s blowout of the Timberwolves, but will miss the playoffs because of the tiebreaker, all because Anthony Davis hit this insane game winner two months ago. No. 1 Seed, Atlanta Hawks - Ho-hum, the Hawks roll into the one seed. They won’t be challenged in the first and maybe not even the second round, but at some point they’ll probably rue Thabo Sefolosha’s absence. No. 2 Seed, Cleveland Cavaliers - Ever since LeBron James went on his little sabbatical, the Cavaliers have looked like monsters. Despite the Hawks having seven more wins, the Cavs are probably the favorites to advance out of the East to the NBA Finals. No. 3 Seed, Chicago Bulls - The Bulls knocked off the Hawks tonight to claim the third seed ahead of the Raptors. Without anything to play for, all 13 Hawks played at least 10 minutes. If the Bulls think the Cavs are better than the Hawks, they might’ve been better off losing this game. No. 4 Seed, Toronto Raptors - The Raptors beat the Hornets, but it wasn’t enough to pass the Bulls. They looked very good for the first third of the season, and have looked very mediocre since. Only the softness of the East prevented them from losing home court advantage. No. 5 Seed, Washington Wizards - 46 wins is the most the Wizards have had since 1978-79, but the season still feels like a disappointment for them. Wizards fans are in a similar predicament to the one Warriors fans were in last year, where they want their team to win, but know that a first round exit might lead to the firing of a bad coach. No. 6 Seed, Milwaukee Bucks - The Bucks have been chilling for the entire second half of the season, attempting to integrate Michael Carter-Williams and make up for the trade of Brandon Knight. If nothing else, they will bring heaps of fun energy to the playoffs. No. 7 Seed, Boston Celtics - Anybody that says they thought the Celtics would make the playoffs is a liar. Brad Stevens is already one of the better coaches in the NBA—he designs the best out-of-bounds plays in the league—and they got even better after trading Rajon Rondo. They are going to get blown out by the Cavs, but with SEVEN additional first round draft picks, their future is very bright. No. 8 Seed, Brooklyn Nets - The Nets needed some help, and they got it. While they were beating the Magic, the Grizzlies were beating the Pacers for them. The Nets and Pacers both finish with putrid 38-44 records, but the Nets won the season series 2-1, and thus the right to play four (and probably only four) more games. The playoffs tip-off Saturday at 12:30 p.m. ET, with the Wizards taking on the Raptors on ESPN. 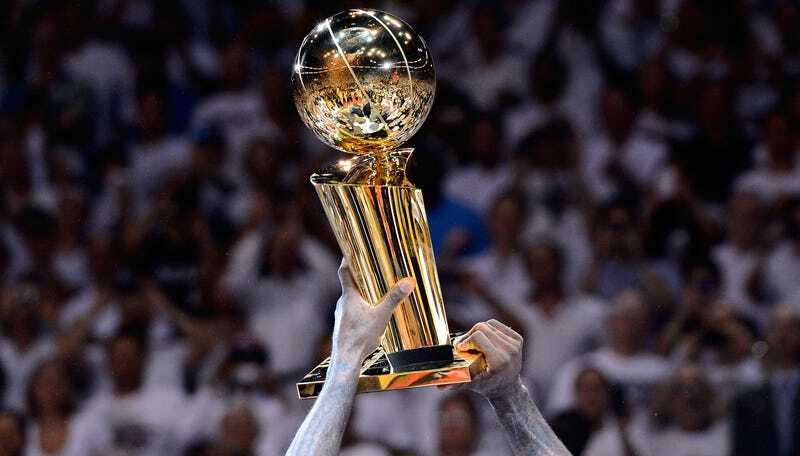 Who do you have winning it all?